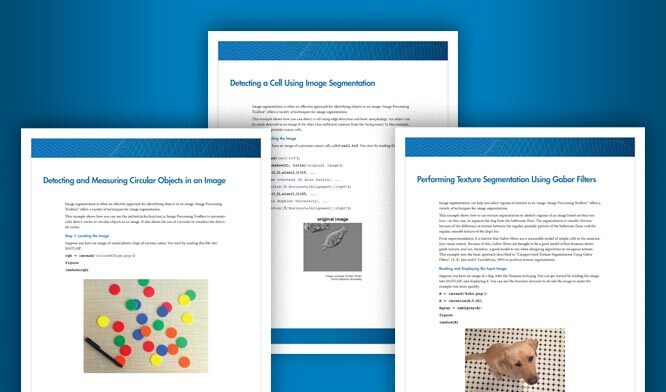 This example shows how to segment colors in an automated fashion using the L*a*b* color space and K-means clustering. 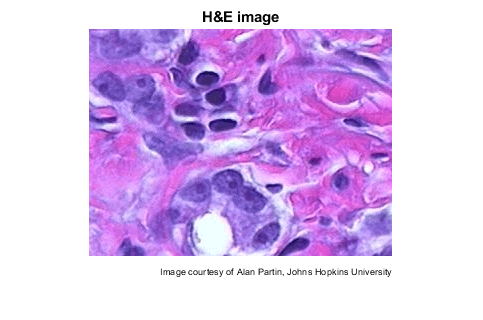 Read in hestain.png, which is an image of tissue stained with hemotoxylin and eosin (H&E). This staining method helps pathologists distinguish different tissue types. How many colors do you see in the image if you ignore variations in brightness? There are three colors: white, blue, and pink. Notice how easily you can visually distinguish these colors from one another. The L*a*b* color space (also known as CIELAB or CIE L*a*b*) enables you to quantify these visual differences. The L*a*b* color space is derived from the CIE XYZ tristimulus values. The L*a*b* space consists of a luminosity layer 'L*', chromaticity-layer 'a*' indicating where color falls along the red-green axis, and chromaticity-layer 'b*' indicating where the color falls along the blue-yellow axis. All of the color information is in the 'a*' and 'b*' layers. You can measure the difference between two colors using the Euclidean distance metric. Convert the image to L*a*b* color space using rgb2lab. 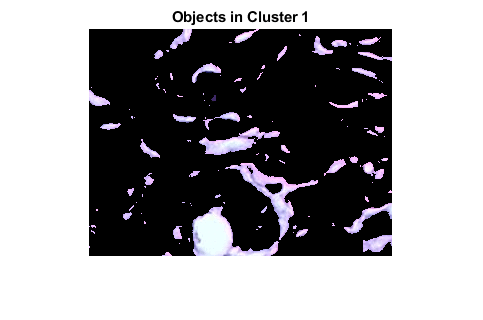 Clustering is a way to separate groups of objects. 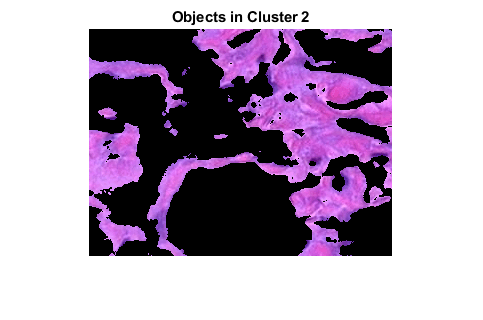 K-means clustering treats each object as having a location in space. It finds partitions such that objects within each cluster are as close to each other as possible, and as far from objects in other clusters as possible. K-means clustering requires that you specify the number of clusters to be partitioned and a distance metric to quantify how close two objects are to each other. 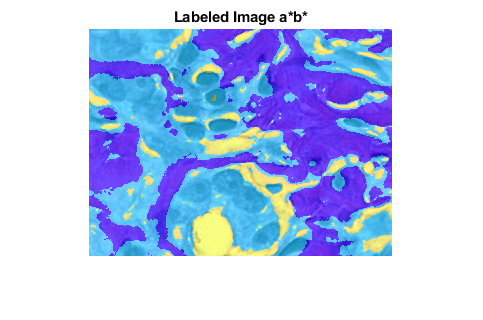 Since the color information exists in the 'a*b*' color space, your objects are pixels with 'a*' and 'b*' values. Convert the data to data type single for use with imsegkmeans. Use imsegkmeans to cluster the objects into three clusters. For every object in your input, imsegkmeans returns an index, or a label, corresponding to a cluster. Label every pixel in the image with its pixel label. 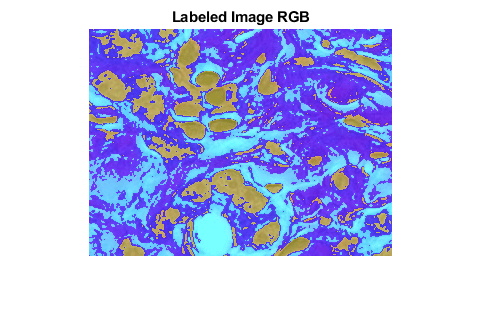 Using pixel_labels, you can separate objects in hestain.png by color, which will result in three images. 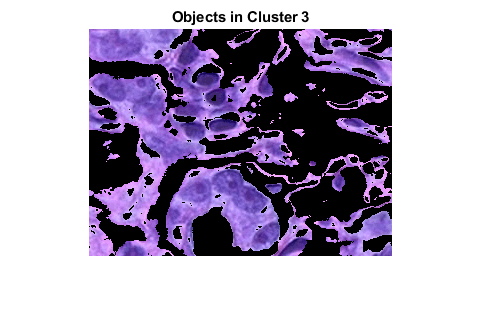 Cluster 3 contains the blue objects. Notice that there are dark and light blue objects. You can separate dark blue from light blue using the 'L*' layer in the L*a*b* color space. The cell nuclei are dark blue. Recall that the 'L*' layer contains the brightness values of each color. Extract the brightness values of the pixels in this cluster and threshold them with a global threshold using imbinarize. The mask is_light_blue gives the indices of light blue pixels. Copy the mask of blue objects, mask3, then remove the light blue pixels from the mask. Apply the new mask to the original image and display the result. Only dark blue cell nuclei are visible.